For the moment, access to this area by climbers should be from a temporary trailhead/parking area that is located near the old Morrell's Wall Parking Lot area. From there, the new Tom's Thumb Trail leads up toward Morrells Wall, Gardeners Wall and on to Tom's Thumb. Please look for, and use designated climber access trails. The McDowell Mountains feature most of the main granite climbing crags in the northeast metro Phoenix area. Several fine formations of rough grained desert granite are found in the area featuring routes of all difficulties. The climbing is traditional in nature, both gear and bolted routes, and climbers should expect to place their own protection on a lot of the routes here. Once threatened by house and golf course development, the city of Scottsdale (with the help of it's citizens, who kept voting in tax $$ support to acquire the land!) managed to turn the whole place into the McDowell-Sonoran Preserve, starting in the mid 90's and continuing to this day. The Preserve today sits at almost 22,000 acres with the eventual plan to encompass some 36,000+ acres! 1) From the intersection of Happy Valley Road and Alma School Road (near Pinnacle Peak and just southwest of Troon Mountain), continue east on Happy Valley Road. Stay with it as it curves around to the north, then turns into the north bound 118th Street. Make a right on Ranch Gate Road (look for signs to the trailhead) and go east to 128th Street. Make another right and go south until you basically run into the trailhead entrance. 2) You can also come in from Rio Verde Drive by turning south onto 128th Street and taking it (initially dirt, then paved) to the trailhead entrance. rocky approach and NOT recommended. Pic of the new park climbing map. Guarding the trail at Toms Thumb. Per Tradster's comment, I didn't actually time the hike in, but I don't think the new parking location adds 45 minutes--maybe 25-30? Hello all, i was wondering if anyone could help me out. I am coming out from Cali this weekend and wanted to do some climbing on the gardeners wall. Is that the best way to approach gardeners wall? any suggestions? I have a older person with me who was gonna watch, but im not sure he can do 45 min in and out. is that how long the approach is from the north east parking area? Below please find the rock climbing guidelines that govern rock climbing in the McDowell Sonoran Preserve. The City of Scottsdales City Council has formally adopted climbing policies and maps for the McDowells. There were years of work and meetings on which this final outcome was based. In order to keep our climbing areas open we will need to abide by these policies and keep the crags clean. As you can see, they are modeled after the Pinnacle Peak Park climbing guidelines. The City of Scottsdale wanted to have similar policies throughout the parks and preserves it owns. The good news is that we can keep climbing. The challenges involve climbing only on designated crags (named and mapped), staying only on official trails and climber routes to access the crags, and complying with the policy of no new bolts in new locations. The City has constructed a new Toms Thumb Trail Head, which is now open. The best way to the new Toms Thumb Trail Head is to take Pima to Happy Valley road and head east. Pass by the 104th Street stop sign, and continue easterly. Eventually Happy Valley turns north for a short while. Turn right/east on Ranch Gate Road to 128th, where after a couple of miles a right turn southbound takes you to the new trail head. This is shorter than going all the way to Dynamite and is the only other alternative. For more information and to discuss any questions please contact Erik Filsinger at smorefil@aol.com. I can also send you the climbing plan (map) for the Preserve. 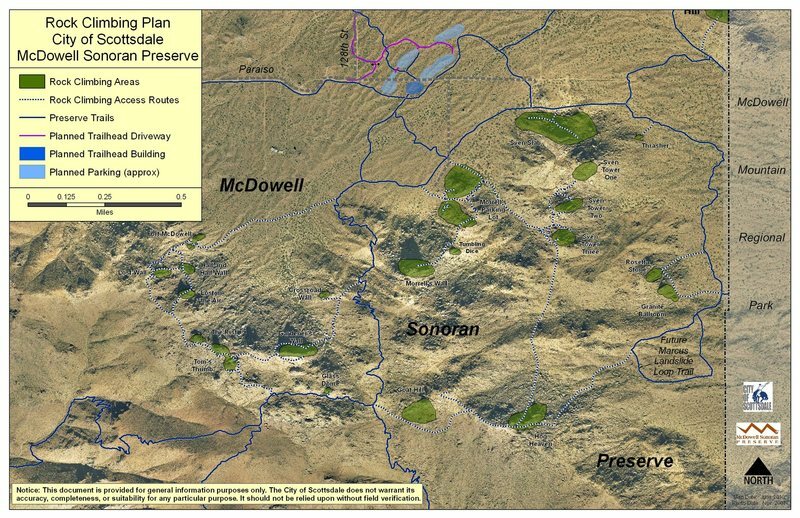 The McDowell Sonoran Preserve has been acquired by the City of Scottsdale to preserve and protect the natural beauty and ecological features of the McDowell Mountains and Sonoran Desert, provide accessibility to the Preserve for passive recreational uses in a safe and healthy environment, and provide educational opportunities related to the flora and fauna of the Sonoran Desert. In order to insure the long-term protection of this natural resource and facilitate the safe use of the Preserve by the general public while mitigating impacts to the natural environment and surrounding residents, Ordinance # 3321 was approved by the City Council on May 23rd, 2000. These Rock Climbing Guidelines provide additional guidance related to accepted practices, responsibilities, and areas where rock climbing will be allowed within the Preserve. Violators of climbing and other regulations and laws governing the McDowell Sonoran Preserve are subject to prosecution resulting in fines and/or imprisonment in accordance with City of Scottsdale Ordinance # 3321. Access to the climbing areas is allowed only via designated and signed climbing access routes, as identified on the Conceptual Rock Climbing Master Plan for the McDowell Sonoran Preserve. These routes connect the primary Preserve trails system to the rock-climbing areas. The City of Scottsdale recognizes, as should all climbers, that all climbing activities are inherently dangerous. Further, it is impossible for City staff to guarantee the safety, experience, or ability of any climber. City staff will not inspect or certify the climbing equipment or ability of any visitor. City staff will not certify any routes difficulty rating, safety or the reliability of any fixed anchor. Preserve visitors climb at their own risk and are solely responsible for their personal safety while climbing on Preserve property. Climbers are expected to secure proper equipment and training, and are expected to adhere to standard climbing safety practices. Safe climbing demands that each climber has experience in route finding, route protection, rope handling, retreat from steep faces, and emergency first aid. 1. All climbing activities are inherently dangerous and may result in injury or death. 2. Climbers climb at their own risk and are responsible for obtaining proper equipment and training. 3. City staff does not create or maintain any climbing route. 4. City staff does not install or maintain the fixed anchors on any climbing route. 5. Route selection and the decision to rely on fixed anchors are the climbers responsibility. 6. New routes are not allowed. 1. Climbing is allowed in designated areas only and must coincide with the Preserves posted hours of operation. 2. Climbers must utilize the designated climbing access routes leading from the main Preserve trail to climbing areas. 3. Temporary or permanent closures of individual routes or specific climbing areas may occur to protect the natural resources or for visitor safety. 4. Fixed anchor locations are limited to those already established, unless subsequently authorized by City Staff. 5. Unroped climbing is not recommended on the larger formations, but bouldering is permitted within the aforementioned climbing areas. 1. All anchor placements will be installed on a volunteer basis by members of the climbing community. 2. All climbing equipment, tools, anchor hardware, and any other costs associated with anchor placement are to be provided by the climbing community. 3. Old anchors are to be completely removed and carried out. 4. When possible, old anchor holes will be redrilled and reused. Otherwise, old anchor holes are to be sealed with a mixture of epoxy and rock dust. 5. City staff will have no role in anchor placements. · Rappelling: Using a rope to descend from a steep slope or face. · Free Climbing: Climbing in which the climber relies on the rope only for safety. Progress is made by using the hands and feet on the natural features. Anchors are typically used, but only to stop a fall; they are not used as climbing aids. · Direct Aid Climbing: Climbing in which the climber is completely dependent on the rope for support and safety. Progress is made by installing protective anchors in the rock and then relying on them to support the climbers weight as the climber stands on them and reaches up to the next anchor. · Bouldering: Climbing that occurs on rock faces usually less than 20 feet high. Typically it involves repeating a sequence of moves up or across a rock face. Usually done without a rope. 2. Fixed Anchor: Climbing protection that is installed and intended to be left as a permanent fixture on a climbing route. The most common examples include pitons, which are hammered into cracks, and expansion bolts, which are drilled into smooth rock faces. This is the new official rock climbing plan for the McDowell Sonoran Preserve, an area owned and managed by the City of Scottsdale. See previous comment for details on the official climbing policies that have been adopted. The northern face of Tom’s Thumb is temporarily closed to public access to protect sensitive birds of prey that are nesting in that area. 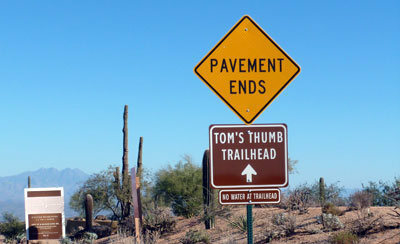 THE TOM’S THUMB TRAIL REMAINS OPEN. The temporary closure restricts public access to a small area at the northern base of the Thumb, and limits rock climbing on several climbs on the northern face. The Tom’s Thumb Trail remains open to public access, and people can still access the eastern base of the Thumb. Temporary fencing and closure signs are in place that restrict access to the northern side, and we ask that the public obey all closure signs. CLIMBERS: If you do climb to the top of the Thumb via the south face, we ask that you stay away from the northern edge, as human presence in that area could negatively impact the nesting falcons. This year’s temporary closure is the same as was implemented the last three years. Similarly, we anticipate the closure to last through mid-June. Volunteers from the McDowell Sonoran Conservancy’s Field Institute will continue to monitor the nesting pair, and the closure will be lifted once the juvenile birds have safely fledged from the nest.